The practice of the country of production of official goals, host the World Cup, France has continued in 1938. 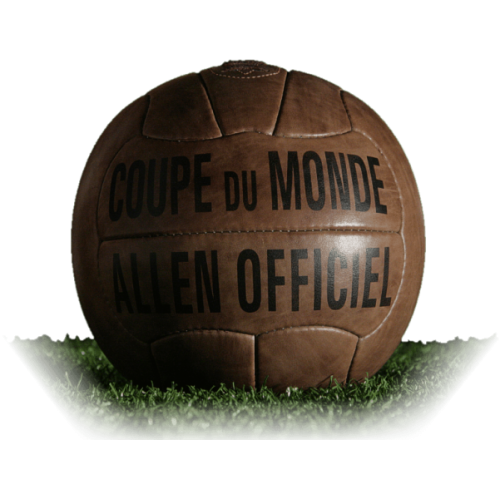 The French company "Allen" has produced the ball of the same name for the National Cup and international competitions in the 1920s. The same model was used at the World Cup. Before each match, the company exhibited branded the ball into center field for photographing. It was one of the first examples of advertising equipment in the history of the sport. However, own branded balls in the game are not subsequently used. The very same "Allen" in its design was similar to the "Federale 102", but the ball panel edges were rounded, and projectile design looked different. Tying is also located on a separate panel was white, but in the game, of course, he instantly became brown. The ball is made by hand and was a perfect pumped. Failure to comply with production techniques deformed projectile that affect the trajectory of the ball flight. New ball in World Cup in Brazil is radically different from its predecessors in that the surface of ..
Official ball of the 1934 World Cup in Italy under the name "The Federale 102" was made a Roman firm..